It's puppy primping time! Watson the dog has an appointment at the Dirty Dog Salon at 4:15 P.M.--but no one can find him! Follow the clock as time runs out to find Watson the Dog in this third Charlie Piechart mystery. Spotting clues, from pink nail polish to cookie crumbs, Charlie and his pal Lewis are determined to get Watson to the groomers for his shampoo and haircut. Can they race against the clock and find him with enough time to make it on time? 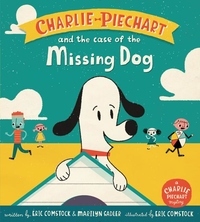 Complete with visual sidebars that illustrate the elapsing and remaining time, the third picture book mystery in the Charlie Piechart series is the perfect addition to any K-2 classroom or at-home library. Young math enthusiasts and time-keepers will adore this actioned-packed treat!